Further, from actual transcripts of radio broadcasts and news accounts, youll learn how he advised and helped others prepare for the sea. 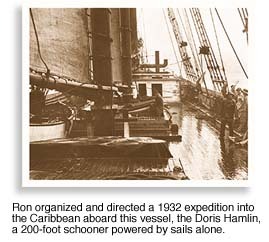 Throughout his lifetime, Ron contributed to the advance of yachting--whether it was the development of a new safety procedure, the testing of a revolutionary small boat navigational device, or the recharting of a channel known for its hidden hazards. From the very beginning, Ron found himself attracted to the sea. As a youth of eight, he learned by trial and error the rudiments of sailing on a lake near Seattle, Washington -- racing against his peers in converted row boats. In 1927, when 16 years old, he crossed the Pacific aboard and ocean steamer, a voyage he repeated several times--and with each trip his fondness for the sea increased. "I loved the sea," he wrote. "I loved steamers and sailboats and surf and sailors." 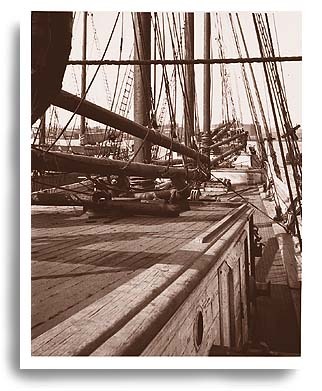 Within a year of that first steamer trip, Ron had signed aboard a Japanese-built sailing schooner plying the coastal waters of China. Here he furthered his nautical experience, working the decks and helm of the ship alongside seasoned merchant mariners and learning how to sight a sextant and fix his position by the stars alone.